“Today the wind was predicted to gust to 41mph by 12 O’clock. We figured we could get to How Hill and be on our way back by that time and the wind would be on our stern for the return leg of the row. Confidently we launched and were immediately impressed, to a man and woman, with the new oars. Skiffie World Championships here we come! The oars are beautifully crafted, balanced to perfection. However, we did need them to be as good as that; as we reached the open Barton Broad the waves were noted to have white crests of spray (sea state 4). Rowing against the wind and waves made for a good workout. Coffee break at How Hill was well earned. The return journey was by comparison a walk in the park! We detoured on the way back to look around the Broad but did not see any otters though they may have seen us first. The rain only started to fall as we were putting Hoi Larntan away – and we were back by midday. Many thanks for the great turnout yesterday – for the great turnover. Bluejacket was whisked off her trailer and lifted on to the building frame in Barrie’s workshop. Then one quick heave and over she went, to rest upside down ready for her full re-paint. As we stood back to admire the effect of our labours, Tom, Roland and Robin had already grasped sandpaper and were starting to rub down the paintwork. After almost constant use on the water and many miles of being towed, since she was launched, Bluejacket’s hull is in remarkably good condition – just a bit grubby. Even the first sanding, everyone else by now having taken the hint and joined in rubbing and scraping, she began to show signs of her former pristine white finish, minus the gloss shine. Andrea made countless cups of tea and coffee as we stood back to let Catherine show us how it should be done! That’s just the start. Saturday afternoons for the next few weeks will require plenty of effort – first finishing sanding, then undercoat/s and top coats, before turning the boat up-right again ready to start on the interior. Barrie’s barn is warm and everyone is welcome! As ever, thanks to Andrea and Barrie. Saturday (tomorrow 23rd) 2 p.m. at Bayfield Brecks, could a good few come please to help to lift and turn her over? With plenty of hands the job is easy and takes no more than a few minutes. Thanks. “At last the ice cleared so we could row Bluejacket out of Barton Turf. The predicted rain was expected to fall at midday so a quick get-away was necessary. Since the forecast wind was gusting 41mph from the South we decided to hide ourselves by setting off up the sheltered River Ant towards Stalham. We were enjoying the row when the shout went up “black ice”! Where the water was flowing, the ice had melted but by the riverbanks there was sheet ice. If we had had a sat nav, I am sure we would have heard “perform a legal u-turn”. The open broad was clear of ice but had the predicted wind head on. The effect of the wind could really be felt on the oars during the recovery phase of the stroke let alone increasing the work required to make headway across the broad. Shelter was gained in Limekiln Dyke where we shared coffee and home-made flapjacks. The return leg was brisk, not only because the wind was now in our favour, but for fun, we did a series of pyramid power up sessions – just because we could! Thanks to the crew who helped after the row and to Rob and Barrie who travelled with me to load and un-load, then re-load the boats. ‘We had a most enjoyable row in Bluejacket this morning to parts of the Broads I had not been to before. Had we rowed across Barton Broad to How Hill, we judged the wind would be against us as we returned to base, therefore we rowed in the opposite direction and elected to keep bearing left when facing a choice. Hence the title of the pictures “the Dilham Run”. Many thanks to everyone who came to help on Saturday. It shows how quickly things can move when we all get stuck in. As ever, thanks to Andrea for keeping us supplied with teas and coffees. Oh, yes – and Nessa had more than her fair share of doggy treats. No complaints there! We made a good start last Saturday on Hoi Larntan. Thanks to Vicky and Peter’s sterling efforts with the sandpaper and Andrea’s tea and biscuits. Barrie and Rob did more in the week and we repaired the cracked plank. There is more to do and one or two are planning to assist this coming Saturday (2 p.m. onwards). If you would like to drop in too and see how it is going, we’d love to see you. Once she is varnished, we’ll bring Bluejacket back for a full re-paint and HL will take her place at Barton. Or turns over – at least. Yes it’s that time again. Hoi Larntan is in Barrie’s barn awaiting a little t.l.c. Thanks to Stephen and Catherine for towing her back from the Carrow cup. First up, she needs a fair bit of sanding to the shiny (well, they were once…) varnished bits. So if you feel up to leaning on a piece of sandpaper and doing a bit of rubbing, you’d be most welcome. This Saturday (tomorrow) afternoon 2nd Jan 2016 at 2 p.m. and then each Saturday after that. 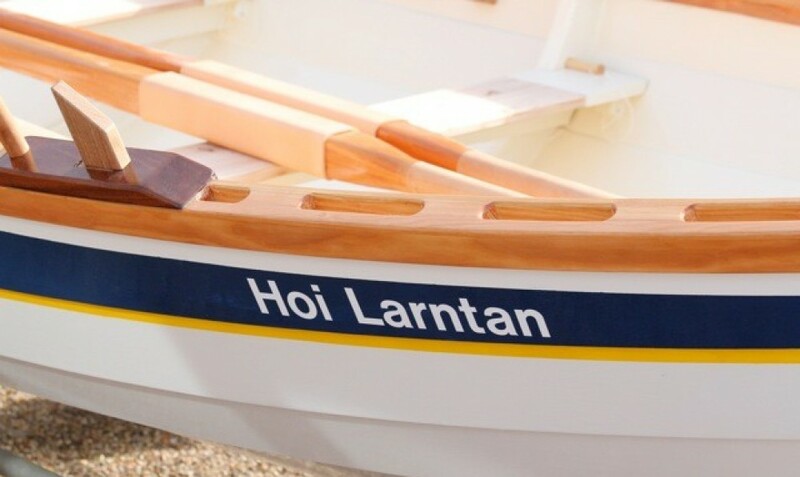 Hoi Larntan is the right way up so no turning over needed – though we shall need some help, please, later when Bluejacket comes in and HL returns to Barton to take up her winter residence. Remember it from last year…?